On Tuesday, for a short window of 2 hours, StoryLTD will offer six artworks by F N Souza on auction. With No Reserve to hold you back, take a chance and bid on these works between 5:30 - 7:30 pm IST. 2 hours. 6 lots. No reserve. Sales touched a total of Rs 5,67,354(US $8,105) Read more..
Absolute Tuesdays will take place online on 12 February 2019. Bidding begins at 05:30 PM (IST) on February 12. The auction features 6 works and will take place exclusively on www.storyltd.com. The structure of the auction and its time span allows serious collectors as well as first-time buyers, worldwide, to place their bids over a period of 24 hours, as opposed to a period of a few hours in a live auction. Proxy bids can be placed once the catalogue goes live. For your convenience, especially if you are bidding on multiple lots, groups of lots are scheduled to close at different times on February 12, 2019. Pre-determined groups of lots will close according to the bid-closing schedule below unless a bid is recorded within a span of 2 minute prior to the lot's scheduled closing time. In this case, the countdown clock for that lot will be reset to 2 minute and the lot closing time will be extended accordingly. Bidding on any lot will only end if there is no bid recorded for a span of 2 minute. These conditions for sale set out the terms on which We offer the Lots listed in the Auction Catalogue for sale on behalf of the seller, and if you make a successful bid, will form a contract for sale between you and the seller. By participating in this online auction, you acknowledge that you are bound by these conditions for sale as listed below. You will find a glossary at the end explaining the meanings of the words and expressions which are in Bold. 1.1 We undertake to sell the Lots through this online auction as agents for and on behalf of sellers. Unless stated otherwise, We have no ownership interest in any Lot in this online auction. 1.2 Making a bid online constitutes an irrevocable offer to purchase the Lot and the acceptance of a bid as the winning bid by Us shall result in an enforceable contract of sale between Us, acting solely as the agent of the seller, and the winning bidder. 2.1 We offer all Lots for sale at the online auction on an "as is" basis, meaning that each Lot is sold with all existing faults and imperfections. We encourage all potential buyers to inspect each item carefully before bidding. 2.2 Any statements made by Us, including by Our representatives/employees, about any Lot, whether orally or in writing, concerning attribution of such Lot to, for example, any school of art or craftsmanship, country or origin, history, provenance or condition, are only expressions of Our opinion or belief. Such opinions or beliefs have been formed honestly in accordance with the standard of care expected of an auction house, having due regard to the estimated value of each Lot. We have not carried out any exhaustive research or analysis on any Lot to be sold in this online auction, and potential buyers should seek appropriate advice on the condition of each Lot from their own professional advisors. 2.3 For the convenience of bidders, We provide condition reports on Lots upon request free of charge. The report includes Our bona fide opinion on the condition of the Lot and is not an alternative to viewing and inspecting a Lot by a bidder, or a bidder's duty to seek independent advice on the Lot, including its description, condition and authenticity. (iii) not rely on an illustration of any Lot given in the Auction Catalogue. 2.5 Neither We nor any of Our Affiliates, agents, representatives, employees or directors shall be liable for errors or omissions in any of the representations made in the Auction Catalogue or otherwise, with respect to the authenticity, description or condition of any Lot for sale through the online auction. 3.2 We may withdraw any Lot before, during, or after the online auction, if We have reasons to believe that the authenticity of the Lot or the accuracy of the description of the Lot is in doubt, or if there is a breach of Our terms of business, or if We otherwise believe, in Our sole discretion, that it would be improper to include the Lot in the auction. 3.3 All Lots shall be sold subject to the Reserve Price. If the winning bid is below the Reserve Price, the Lot shall be considered unsold. The Reserve Price on each Lot shall be confidential and We shall have no obligation to disclose the same to any bidder. Lots sold in "Absolute Auctions" or marked as sold with "No Reserve" are not subject to a Reserve Price and will be sold to the highest bidder, irrespective of the bid amount. 3.4 We have the sole and absolute discretion to: (i) determine the form and content of the descriptions of Lots in the Auction Catalogue, (ii) granting bidding access to a bidder, (iii) recording, rejecting or accepting bids, and (iv) deciding which bid constitutes the winning bid, if any. 3.5 Online bidding access, and access to the MobileApp and the telephone bidding facility, shall be given at Our discretion and We may set limits on the number of bids that may be made by a bidder and/or require payment guarantees or deposits as a precondition to giving bidding access to a bidder. Bidders will be informed of their bidding limits, if any, and will not be allowed to bid further if their bidding limit has been exhausted. 3.6 Bid updates and time extensions, if any, shall be updated on the Website. On the Website, bidders may refresh bidding values by clicking on the "Refresh" icon or the re-load/refresh buttons on their browsers, to view latest bid updates and time extensions, if any. We shall evaluate the bid histories of specific Lot groups periodically to preserve the efficacy of the auction process. This exercise may be conducted by Us internally or through third parties solely at Our discretion. 3.7 All bidders are required to provide complete and accurate invoicing details to Us at the time of registration for the auction and invoicing details once registered will not be changed. The bidder shall be invoiced based on details provided at the time of registering for the auction. New bidders are advised to register at least 48 hours prior to the bid. Know-Your-Customer (KYC) documents and/or financial reference letters are required for individual and corporate clients and We will not grant bidding access if the bidder registration and KYC procedures are not complete. 4.1 For the convenience of bidders, in particular bidders who are placing bids on more than one Lot, Lot groups are scheduled to close at different times during the auction. 4.2 The bidding for various Lot groups shall be closed in accordance with the bid closing schedule. However, a bid can be recorded by Us in the 2 minutes prior to the closing time of the Lot. The closing time for such Lot shall be extended to a time that is 2 minutes after the time that the last bid was made. In the event of extension of closing time in accordance with this paragraph, bidding on the Lot shall only end if no bid is recorded by Us for a continuous period of 2 minutes. Bidders are advised to click on the "Refresh" icon on the Website page being viewed by them or on the "Refresh" button in the browser at regular intervals (in accordance with the provisions of paragraph 4.4 below) for updates on latest bids and time extensions, if any. 4.3 The Website shall also contain a "My Auction" filtered view of the Auction Catalogue and the bidder may click on this link to access information on all bids made by the bidder in respect of various Lots. For ease of tracking bids, bidders are advised to assign bidding nicknames to themselves. The Website shall contain the bid history for each Lot, being the bid amounts that have been recorded since the start of the auction till the current highest bid; and a countdown clock indicating the amount of time available for placing bids before the closing time. 4.4 The bid history, current bid and countdown clock shall be accurate at the time of downloading of those values. However, such information shall not reflect any changes in the bid history, current bid and/or countdown clock that may have occurred during the time taken for this information to reach the bidder's computer from Our server. The most updated bid values shall be shown only when the information on bid values is refreshed, which shall happen either automatically, or when a bidder clicks on the "Refresh" icon on the Website page, or on the "Refresh" or "Reload" button on his/her internet browser. After the values on the page have been refreshed, any changes in the bid history shall not be visible to the bidder until the values are refreshed again, whether automatically on the Website, or by the bidder. 4.5 When the countdown clock counts down to zero, in the case where the closing time in respect of a particular Lot has been extended by a further 2 minutes pursuant to paragraph 4.2 above, the countdown clock may not reflect such extension. The bidder may wait for the values on the page to refresh automatically on the Website, or click on the "Refresh" icon on the page, or on the "Refresh" or "Reload" button on his/her internet browser after the countdown clock has counted down to zero to determine whether the closing time has been extended for that Lot. 4.6 The countdown clock combined with the current highest bid as shown on the bid history on the Website shall only be an indication of the highest bid amount at the time when the values on the Website were refreshed in the manner set out in paragraph 4.5 above. Should bidders want more frequent updates, they are advised to refresh values as described in paragraph 4.5 above in order to view the most updated bid history and countdown clock. 4.7 Bidders may download the MobileApp onto any mobile device that supports Android and iOS, and use it to place advance bids. To avail of this service, you must be registered as a bidder. We do not accept any liability in the unlikely event that a bid through the MobileApp is not executed or executed incorrectly. 4.8 The foreign currency exchange rate used is constant during the auction, and has currently been set at 1: 70 (USD: INR). Prior to the start of the auction, We may at Our discretion change the exchange rate used, based on fluctuations in market exchange rates. The estimates for individual Lots have been 'rounded off' for ease of reference and may not reflect the exact exchange rate used for bid calculations. 4.9 Technical Downtime: In the unlikely event that the Website or MobileApp is inaccessible to bidders or partially disabled due to Technical Downtime at any time during the half an hour prior to the scheduled closing time of the auction for any of the Lot groups, the closing time of that Lot group and subsequent Lot groups will be extended by the duration of such Technical Downtime. In case the Technical Downtime extends beyond the closing time for a particular Lot group, the Website and the MobileApp, as the case may be, shall, after the Technical Downtime, show the auction for the particular Lot group as closed. However, the closing time for such Lot group and subsequent Lot groups shall be extended by the duration of the Technical Downtime and appropriate details of the extension shall be published on the Website shortly after recovery from the Technical Downtime. Bids recorded prior to any Technical Downtime will be treated as valid. We shall not be liable for any loss of information due to the Technical Downtime. The data logs of Our server will determine the duration of the Technical Downtime and any determination made by Us in respect of extension of the closing time shall be final. 4.10 Due to the nature of internet and/or mobile traffic, there may be an unpredictable time-lag between a bidder placing a bid, and that bid being received by Us. Therefore, although a bidder may have placed his/her bid prior to the closing time, the bid may be received by Us after the closing time for the Lot in respect of which the bid has been placed and shall, in such an event, be rejected. In order to prevent bids being rejected in such a manner, bidders may set proxy bids/automatic bids on Lots which the bidder wishes to bid for. 4.11 Proxy bids may be recorded with Us 12 hours prior to the closing time, subject to the other provisions of these conditions for sale, including any limits imposed by Us on the number of bids that a bidder may place. Proxy Bids are accepted from bidders once they have been given bidding access for the auction and may be entered prior to auction start and up until the auction closes. 4.11a Once a bid is registered in Our system, whether placed by an active bidder or by proxy, it is immediately and automatically displayed for all registered users to see. 4.12 Bidders are advised to keep their login ID and password secure at all times. We will hold the bidder responsible for all bids placed using their login ID and password, whether via the Website or through the MobileApp. Bidders choosing to bid via telephone are advised to re-set their passwords at the close of the auction. 4.13 Our employees may not bid in the auction once the auction has started. They may, however, submit an absentee/proxy bid for an amount which may be equal to or above the lower estimate of a Lot before the auction commences. Once the auction has started, they may not increase their bid or alter it in any way. Our employees may also bid in charity auctions that are held on the Auction Platform. 4.14 Our Auction Platform does not allow any bids to be placed by Us on behalf of a seller. All bids recorded are from registered bidders. 4.15 We have the right to exercise reasonable discretion in setting bid increments, refusing any bid, advancing the bidding, withdrawing or dividing any Lot, combining any two or more Lots, and in the case of error or dispute, during or after the sale, determining the successful bidder, continuing the bidding, cancelling the sale or reoffering and reselling the item in dispute. If any dispute arises after the sale, then, in the absence of any evidence to the contrary, the sale record maintained by Us will be conclusive. 4.16 We reserve the right not to award the winning bid to the bidder with the highest bid at the closing date if We deem it necessary to do so. 4.17 We shall retain the right to display the results of the sale and Lot details sold by Us, including catalogue descriptions and prices on the Website at all times, including after the completion of the sale. We regret that We cannot agree to requests to remove these details from the Website. 4.18 At Our discretion, proxy bids submitted on "no reserve" Lots will be executed at a minimum of 10% of the lower estimate of the relevant Lot if there is no competing bid, and provided that the proxy bid amount is greater than such minimum value. Notwithstanding the above, in the event that there is a bid lower than such minimum value and there is no competing higher bid, then We may, at Our discretion, execute the Lot at such lower value. 4.19 The closing bid is considered a winning bid, only if the bid equals or exceeds the Reserve Price. If the closing bid on a particular lot is below the Reserve Price, it will not be considered a winning bid and the lot will be deemed unsold. However, if the closing bid belongs to a proxy bidder and is below the Reserve Price, but the proxy bidder’s maximum bid price exceeds or equals the Reserve Price, then the lot will be sold to the proxy bidder at the Reserve Price. 5.1 We will raise invoices on the winning bidder for the sale price and Buyer’s Premium, applicable taxes on sale of Lots and other additional charges that may be incurred by Us, if any, including shipping and handling of the Lot and additional levies. 5.2 The title to the Lot shall pass from the seller to Us outside the territory of the United States of America. The title to the Lots purchased shall pass to the winning bidder at the time that bidding is closed for each Lot and such winning bidder shall thereafter assume full risk and responsibility for such Lot. In any event, the Lots purchased will not be released or shipped out to the winning bidder or his/her representative until the winning bidder has fulfilled his payment and other obligations as described in these conditions for sale. 5.4 Irrespective of the currency in which the bidders have placed their bids, winning bidders located in India will be invoiced in INR and all other winning bidders will be invoiced in USD. Payments must be made in the currency on the invoice in any of the following modes of payment. NOTE: Payments in excess of USD 5,000 (or its INR equivalent) must be made through a wire transfer or cheque. We and Our Affiliates will not be held responsible for any refusal or failure to accept modes of payment not outlined above. 5.5 The winning bidder shall pay the sale price and Buyer’s Premium in full (including applicable taxes and other charges, if any) within 7 business days from the closing date of the auction. No shipment or delivery of the Lots will be made to the winning bidder if the sale price and Buyer’s Premium (including applicable taxes and other service charges, if any) are not received by Us and until all proper documentation in connection with the sale of the Lot has been completed. Payments will not be accepted from any parties other than the winning bidder as recorded on the invoice. 5.6 The winning bidder acknowledges that We will abide by any export restrictions that may apply in the countries from where specific Lots will be shipped. The winning bidder shall also be responsible to ensure that the concerned Lot is freely importable into his/her country or to the country where the destination for delivery (as specified by the winning bidder) is located. If the winning bidder or We become aware of any restrictions to such import subsequent to the completion of the auction, the winning bidder shall provide an alternate delivery destination to Us. All costs associated with the process of delivery and storage (when required) of the Lot shall be borne by the winning bidder. The Lot(s) shall be handed over to the winning bidder or his nominee only upon full payment of all such costs. 5.7 Lots marked as "Art Treasures" under the Antiquities and Art Treasures Act of 1972 cannot be exported outside India. If you are the successful bidder for any such Lot, you agree not to export such Lot outside India. Each winning bidder is solely responsible for meeting the requirements of the Antiquities and Art Treasures Act of 1972 or any related state legislation. Please note that the Lots are marked for your convenience only, and We do not accept any liability for errors or for failing to mark the Lots. 5.8 Non payment: In case payments are not received within 7 business days of each invoice, We shall treat the same as a breach of contract of sale by the winning bidder, and the seller may, in such an event, authorise Us to take any steps (including the institution of legal proceedings), as it may deem to be appropriate to enforce payment by the winning bidder. In addition, the winning bidder will be charged demurrage at 1% of the total value (winning bid plus Buyer’s Premium), or INR 10,000 per month, whichever is higher, till the date of actual payment. 5.9 Failure to collect: If the winning bidder informs Us that he/she wishes to collect the Lot from Us in person and if such Lot is not collected by the winning bidder within 30 days of the payment formalities being completed, We shall arrange for storage of the Lot at the winning bidder’s expense, and shall only release the Lot after payment has been made, in full, of the sale price and Buyer’s Premium, including storage and insurance at applicable rates. 5.10 We shall be entitled to exercise a lien on the Lot for payment of any sums due to Us from the winning bidder, including the sale price, Buyer’s Premium or costs relating to storage and insurance where they are to be borne by the winning bidder, in relation to any Lot purchased by the winning bidder. 6.1 We provide a limited guarantee on the authenticity of the Lots for a period of one year from the date of the auction of such Lots. Under this limited guarantee, We only guarantee characteristics or features mentioned in all capital letters in the heading of the "Description of the Property" in the Auction Catalogue (in the case of the MobileApp Auction Catalogue, the characteristics or features mentioned in all capital letters may be displayed in a position other than the heading) till such time that the Lot is in Our possession. Wedo not guarantee any other attribute of such Lot. 6.2 In the unlikely event that within one year from the sale of the Lot through auction, it is proved by the winning bidder, to Our reasonable satisfaction, that the Lot was not authentic and if, in Our opinion, bidders being aware of such error or omission would have bid significantly less than the actual sale price, We shall be entitled to rescind the sale, and the seller will be liable to refund to the winning bidder the sale price paid for the Lot. Once We obtain the refunded amount from the seller, We shall forward the same along with the amount charged by Us as the Buyer’s Premium to the winning bidder. We shall not be accountable to the winning bidder for any taxes, shipping, handling or any other charges that may have been applicable at any time from the sale of the Lot till the claim. 6.4	All such claims will be handled on a case-by-case basis, and in the case of an authenticity claim, will require that examinable proof, which clearly demonstrates that the Lot is not authentic, is provided by an established and acknowledged authority. Our decision in respect of such claims shall be final and binding. 6.5	In all cases, We retain the right to consult with, at the expense of the winning bidder, two recognised experts in the field (such experts being mutually acceptable to Us and the winning bidder), to examine the Lot under question before deciding to rescind the sale and offer the refund under the guarantee set out above. The opinion of the experts shall not be binding on Us. 6.6	In the event of the seller’s failure to refund the proceeds as stated in this paragraph, the winning bidder shall return the concerned property in the Lot to Us and authorise Us as its agent to initiate legal proceedings against the seller. Any such steps taken or legal proceedings instituted by Us against the seller shall be to the cost of the winning bidder. We will maintain the confidentiality of your personal information as disclosed to Us and undertake to not disclose such information to any third party, unless otherwise required by law or a governmental authority. 8.1 We have an obligation to refund the sale price and Buyer’s Premium to the winning bidder only in the circumstances described above (in paragraph 6). Damages to, or losses or loss in value of any of the Lots (excluding frames) incurred during shipping and transit are covered as per the insurance policy obtained by Us. In case the winning bidder opts out of insurance coverage arranged for by Us, We shall not entertain any claims for damage or loss during shipping and transit. Subject to the authenticity guarantee above, neither Our suppliers nor Us, nor any of Our employees or agents, shall be responsible, either for the correctness of any statements as to the authorship, origin, date, age, attributes or genuineness of any Lot in the sale, or for any mistakes in the description of the Lots, or for any faults or defects in the Lots, or for any other act or omission whatsoever. We offer no guarantee or warranty other than the limited guarantee set out in paragraph 6 above. 8.2 The rescission of the sale and the refund of the total sale price paid by the winning bidder is the sole remedy that may be sought by a winning bidder, and such remedy is exclusive and in lieu of any other remedy which may otherwise be available under law. We shall not be liable for any incidental or consequential damages incurred or claimed. All content of Our Auction Catalogue, the print catalogue, eCatalogue and content on the Website and the MobileApp are copyright protected in favour of "Saffronart". All trademarks, names, brand names, etc. used in the print Auction Catalogue and on the Website and the MobileApp are either trademarks or registered trademarks of Saffronart, or of their respective owners. Any rights not expressly granted herein are reserved. No image, illustration or written material may be used or required without Our prior written permission. We and the seller(s) make no representation or warranty that the winning bidder of a Lot will acquire any copyright or other reproduction rights in it. (ii) sending a courier to the address disclosed by the bidder to Us. the dispatch of the notice by courier. If any part of these conditions for sale is found by any court of law to be invalid, illegal or unenforceable, that part may be discounted and the rest of the conditions shall be enforceable to the fullest extent permissible by law. (ii) The United States of America, in the event that the seller is located in any jurisdiction other than in India. Such laws shall apply to the construction of the conditions for sale and to the effect of the provisions thereof. (ii) New York, USA, in the event that the seller is located in any jurisdiction other than in India. Lots marked with are not situated in India and therefore, may only be bid for and purchased in USD. Persons residing in India, wishing to bid in USD must be eligible under the various foreign exchange regulations to make payments overseas. Please contact Saffronart for further details. Lots marked with indicate that Saffronart owns the Lot in whole or in part or has an economic interest in the Lot equivalent to an ownership interest. Lots marked with have been imported into India, and in order to remove the Lots from a Free Trade Warehousing Zone and into Indian free circulation, a customs duty at 10.3% will be added to the hammer price. The applicable VAT/CST will be charged on the amount inclusive of the hammer price and the duty. 1. Affiliates: Saffron Art Private Limited, Planet Saffron Inc. and their holding or subsidiary companies as on the date of the online auction. "StoryLTD" is a service of Saffronart available through the Website. 2. Auction Catalogue: The catalogue published by Us, whether in print, on the MobileApp or on the Website, containing details of the auction along with the description, price and other details of Lots to be offered for sale at such auction. In case of any discrepancy between the print Auction Catalogue, the MobileApp Auction Catalogue, the online Auction Catalogue and/or the eCatalogue, the online Auction Catalogue, as modified by Us from time to time, shall take precedence. 3. Buyer's Premium: The amount charged by Us from a winning bidder for services rendered by Us, in accordance with these conditions of sale, in connection with the purchase of the Lot(s) by the winning bidder. 4. Lot/Lots: An item to be offered at the online auction, including two or more items to be offered at the online auction as a group. 5. Our/Us/We: Saffronart Management Corporation, acting either on its own behalf, or as a representative of any of its Affiliates. 6. 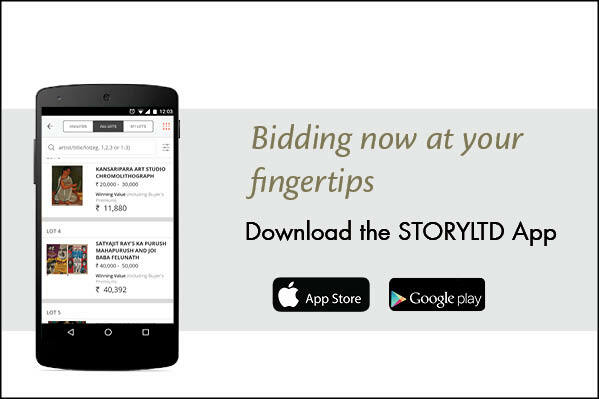 MobileApp: Mobile application developed by Us, providing a mobile Auction Platform for the auction. 7. Reserve Price: The minimum price that a seller has communicated to Us as being acceptable for the sale of a Lot through an auction. 8. Technical Downtime: The time period during which Our server or Website or MobileApp is not in operation due to a malfunction. 9. 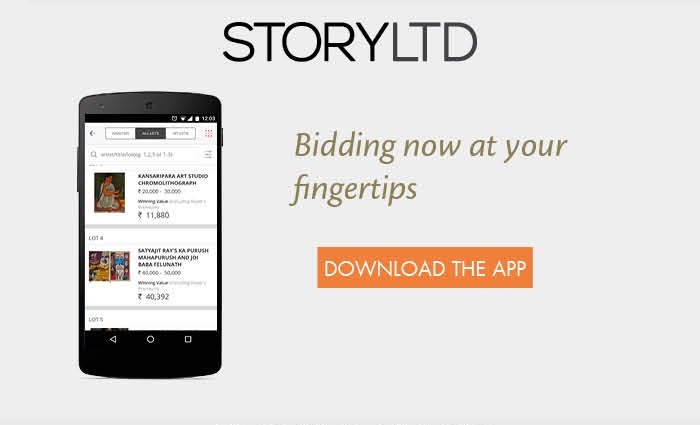 Website: Our Website for the purposes of the online auction, located at the URL www.storyltd.com.